Tomorrow, for the 67th year, young people from throughout the Freedom Valley will race in the Soap Box Derby in Conshohocken. This is a 4th of July tradition that brings family, friends, and neighbors to Fayette Street. The Conshohocken Soap Box Derby will start at about 8:30 AM on July 4, 2018. The race starts on Fayette Street near 8th Avenue and ends on Fayette Street near 5th Avenue. Prior to the race, all of the participants will gather at the Fellowship House for a group photo. The photo above shows two of the racers going down Fayette Street in 2016. There are three divisions in this year’s race. The Stock Division includes 29 boys and girls this year; these children are 7 to 13 years of age. The Super Stock Division will have 19 children participating this year; these young people are between the ages of 9 and 18 years. The Masters Division includes 6 individuals this year; the individuals are 10 to 20 years of age. Participants work with their parents, their siblings, and their friends to build their cars from kits purchased from the Soap Box Derby in Akron, Ohio. The kits range in price from $465.00 to $730.00. Some of the young people that participated in the 2017 Soap Box Derby in Conshohocken are seen here as they gathered in the Fellowship House prior to last year’s race. Mr. Marine has been active with the Soap Box Derby in Conshohocken since 1989. In his “regular” job, Mr. Marine is a cable splicer with Verizon. He started with the former Bell Telephone of Pennsylvania 39 years ago. 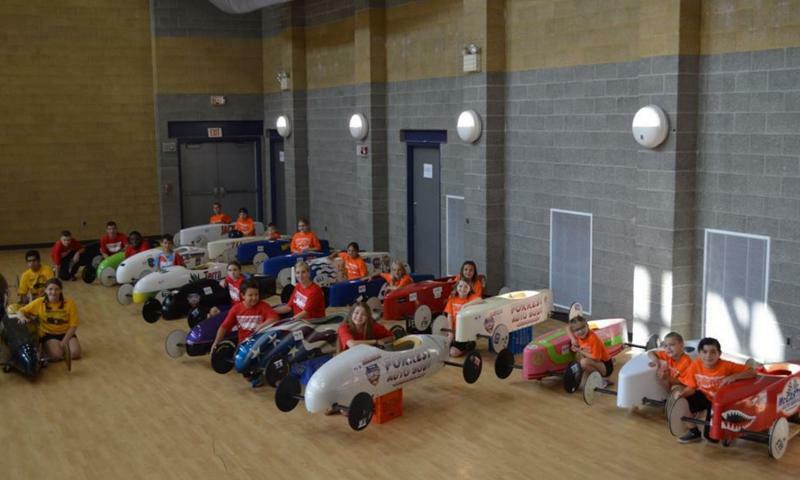 The race area for the Conshohocken Soap Box Derby includes seven school districts, including Colonial, Lower Merion, Methacton, Norristown Area, Upper Dublin, Upper Merion Area, and Wissahickon School Districts. Beyond these communities, children can also participate if their community does not have a race itself. One child last year, for example, hailed from Philadelphia. 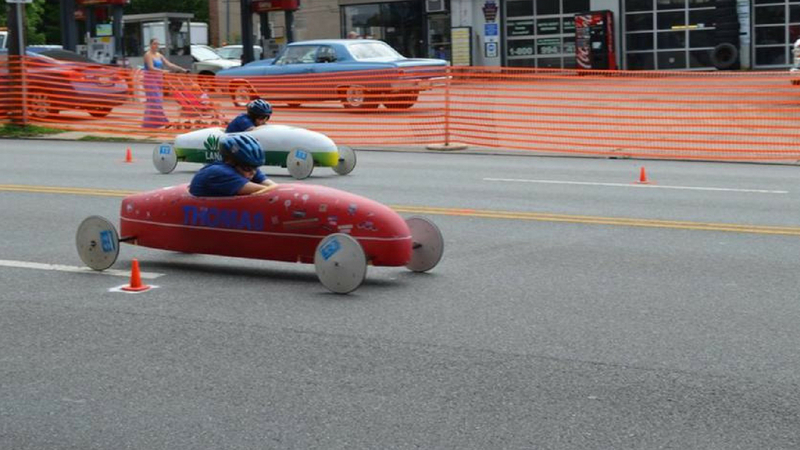 Beyond the race in Conshohocken, soap box derby races are also held in lower Bucks County, the Indian Valley of Bucks and Montgomery Counties, and Pottstown. 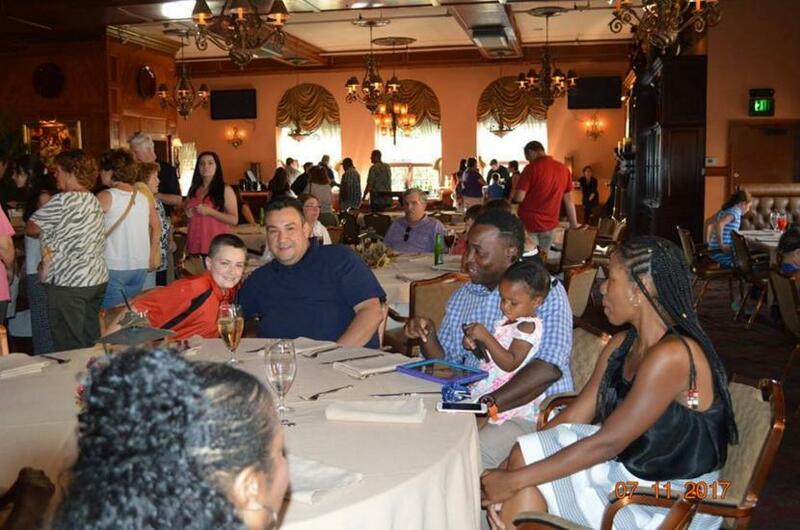 Race participants, family, and friends are seen here as they attended the annual banquet of the Conshohocken Soap Box Derby last year. This year’s banquet will be at The Great American Pub on July 5, 2018. On July 5th, racers with their family and friends will join together in the annual awards banquet at The Great American Pub. The top four winners in each division get cash awards: First Place, $150.00; Second Place, $100.00; Third Place, $75.00; and Fourth Place, $50.00. The top eight winners in each division each get trophies. All of the other children receive participation awards. In addition, the winning family in each division gets $500.00 in cash to help defray some of the travel costs to go to Akron, Ohio. The three winners from Conshohocken – one in each division – will be able to participate in race week activities in the Ohio community starting on July 15th, with the All-American Soap Box Derby held on July 21, 2018. The photographs of the Conshohocken Soap Box Derby are courtesy of that organization, 2016 and 2017.